Part of the Alien Nation season on BBC Four, which look into the weird and slightly gruesome insect world, 'Can Eating Insects Save The World?' is probably one of stand out documentaries in this season. Now you could be fooled into thinking that this show is an extreme version of 'I’m A Celebrity...Get Me Out Of Here!' but watching that is a walk in the park compared to this compelling documentary. 'Can Eating Insects Save The World?' 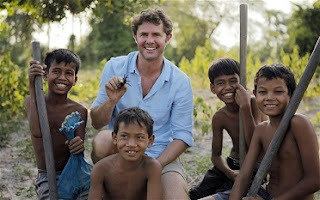 follows Stefan Gates as he takes us on a journey across Thailand and Cambodia catching and tasting such delicacies as: fried water bug, red ant egg omelette and grilled tarantulas. As he tastes the foods like he is on 'MasterChef', Gates tries to find out if eating insects can be an alternative if meat stops being produced - which I’m praying does not happen anytime soon. By visiting different parts of Thailand and Cambodia, Stefan is able to see how different people catch, kill and eat these delicacies. To quite a few reading this you might be holding your stomach but to the people in those locations, it makes for a great meal that is full of protein and they enjoy! In one part of the documentary, we are taken to a popular market where we see a Thai lady frying a water bug and watching Gates tucking in before showing us the eggs and some green pus, YUCK! Besides the whole “Bushtucker Trial” style eating, Stefan Gates tries to make a point on that we probably could survive on a diet of crickets with a side of grasshopper but I don't see this trend catching on in the UK anytime soon. Crickets could produce 100 babies each day but until the day when all food is wiped out of the world, I will stick to some chicken strips! Catch 'Can Eating Insects Save The World?' on BBC iPlayer. One of the USA’s hottest new shows has landed in the UK, and it is being a southern feeling to MORE4. Staring 'American Horror Story'’s Connie Britton and 'Heroes'’s star Hayden Panettiere, who play rivalling country superstars Rayna James and Juliette Barnes. Now before you start thinking this is the country version of 'Glee', the amount of drama in 'Nashville' makes you look past the slightly cheesy songs. Rayna James (Britton) is the big superstar whose fame is starting to fade whilst juggling her family life. Rayna’s latest album and tour are relatively struggling so she is offered a deal to headline with Juliette Barnes a rebellious, out of control version of Taylor Swift (minus all the 1D dating). As you can predict that does not set well with both parties. When you watch more into the series you start to see the reasons why both Rayna and Juliette seem so tense about their careers, it seems to be the only thing that makes them happy! 'Nashville' also shines the light on newcomers Clare Bowen and Sam Palladio who play Scarlett O’Connor and Gunnar Scott, a blossoming duo who claim they are “friends” but when they sing together their passion comes alive. Maybe a future couple alert? Mostly likely but not without them dating other people and dragging out the whole “will they, won't they” scenario. Although the songs in 'Nashville' can be quite corny and cringeworthy to watch, they do help to set the scenes for what is next to come. Whether or not 'Nashville' has the staying power to go on is up to the ratings in America but it looks we will be getting some more of their Southern hospitality with a second series likely to be commissioned. Catch 'Nashville' every Thursday at 9pm on MORE4 or to see previous episodes from the series catch up on 4oD.